On April 16, 1972, two celebrities arrived at the National Zoological Park to throngs of adoring fans. Panda pair Ling-Ling and Hsing-Hsing were a gift to the United States from China. The arrival of biologist Devra Kleiman at the zoo the same year was much quieter, but marked the beginning of a new era in conservation and reproductive biology. 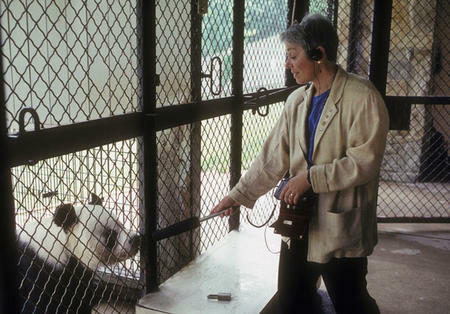 Devra, who passed away last month, was well known for her research on panda behavior and reproduction. Based on her own observations, she questioned the conventional practice of keeping the pandas separate except to mate. At a time when successful captive breeding of pandas was rare, Ling-Ling gave birth five times (none of the cubs survived). Devra was equally well known for her golden lion tamarin (GLT) research. For almost 30 years, Devra coordinated the Golden Lion Tamarin Conservation Program. At the time it was created in 1972, GLTs were facing extinction. In 1984, the Program successfully reintroduced the first of many GLTs into the wild. Devra didn’t just “do” science—she documented it as well. 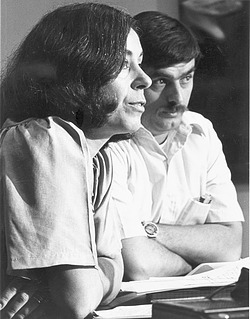 Just before her retirement in 2001, she sent approximately twenty cubic feet of her research records and subject files to the Smithsonian Institution Archives. Having been hired by the Archives that same year, one of my earliest projects was to process Devra’s records. And what a perfect project for me! I have always been a frequent visitor of zoos. As a child, I always loved the energetic little monkeys with hair the same color as mine and had even once “adopted” a golden lion tamarin from the Philadelphia Zoo. As an adult, I was swept up in the second wave of panda fever that flooded DC with the arrival of Mei Xiang and Tian Tian in December 2000. Devra’s research records also provided me with the opportunity to learn a new skill set. She often used videotape instead of, or in addition to, a pen to record her observations and she was involved in the production of (at least) two documentaries recorded on 16 mm film. Much of what she transferred to the Archives was these audiovisual materials. I found myself learning the basics of how to identify and properly store videotapes, including formats I had never seen before, as well as how to use a hand-wind and to fix film splices. These are skills I never thought I would need to know, but they proved to be useful in many processing projects and I have even passed them along to several other staff and interns. It was not until 2007 that I finally met Devra. She was serving as a scientist emeritus at the zoo and the building in which she had spent much of her career was slated to undergo some renovations. She volunteered to assist in cleaning out some storage spaces. For years, scientists and other staff had been placing research materials and administrative records in these spaces and no one remembered what was in them. Devra was vital to the project in that she was one of the few people who could identify (or at least make an educated guess) various groups of files and their creators. In our conversations, she showed a great interest in ensuring that records of potential research value made their way to the Archives while not burdening the collections with duplicate materials. Devra’s work will live on, not only at the National Zoological Park and in the greater conservation community, but also in her records at the Smithsonian Institution Archives where they will be available for generations to come. Devra’s work is well represented throughout the records of the National Zoological Park, Dept. of Zoological Research. A full list of these collections in the Archives can be found via the Smithsonian Institution Collections Search Center. 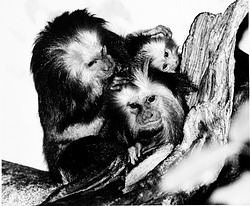 More information about the National Zoological Park’s conservation efforts related to pandas, golden lion tamarins, and other animals can be found on the their website and in the historic issues of the Friends of the National Zoo’s publication, Smithsonian Zoogoer.